Hello and welcome to my Astronomy Blog, I'm Andy Hutcheon but most people know me as Hutchy or Hutchyweb firstly due to my surname (you don’t have to be an Astrophysicist to work that one out) and partly that I work in I.T. and have made many websites for people and had various incarnations of my own site (www.hutchyweb.co.uk). I have always been interested in science and especially Physics not to mention all things electronic and I just love to see how things work and why. For many years I have gazed at the stars in amazement hoping to see a shooting star or a satellite whizz past and on occasion I’ve seen something but never knowing what I’d just seen, which adds to the excitement! 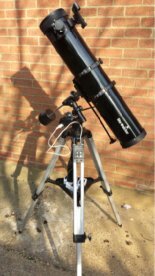 For the past 6 years or so I have really wanted a telescope but could never afford to buy a good one and I didn’t want to disappoint myself if I couldn’t see what I was expecting to see, I also wanted something that I could use for imaging that had tracking – not cheap for someone entering a new hobby. Christmas 2013 my wife said that she hadn't got a present from our boys to me yet, so if I wanted something special she gave me the money and I could get what I wanted (I must admit a telescope wasn’t high on the list). We were out Christmas shopping when I popped in to Camera World and WOW I saw it a SkyWatcher 130M! It was like a light was shining form the Astronomical havens lighting it up (it was probably a display light in the shop) it had everything eyepieces x2 Barlow and most of all a R.A. motor drive (I wasn’t sure what that was but I knew it was tracking of some kind. I looked at the price tag (RRP) and like so many things today I thought “I’m sure I can get the cheaper on the net” so we wrapped up our shopping and headed home. (See what I did there…Ha Ha). After a short search on the net I found I could save a few quid (not a lot but it all helps) that was it, it was about time for a scope! I ordered the scope and couldn’t wait for it to arrive. Well the scope arrived and in good tradition my wife wrapped it up for Christmas and told me I couldn’t open it until Christmas morning. Well as you can imagine I wasn’t best pleased but hay ho-ho Christmas day was only a few days away. With two young boys and family all over the place I managed to unwrap my new scope but never got time to open it until at least 29th December but it was as amazing as I remembered it stood in the shop, such a lucky boy! I did try a few more times with the scope with not a lot of success! Don’t stop reading i get better!